So where was I? Oh yes, continuing to downsize. Over the last few months we have managed to be rather successful cleaning out our closets. Today I made a concerted effort to make another pass at the closet in the master bedroom. Several months ago I made a first sweep, getting rid of many items on the top shelf that were just being stored away and unused. But today I tackled my clothing to see what I could get rid of. This was my second attempt at my side of the closet, and my wife still needs to go through her things on her side. I tend to look at downsizing like editing the written word. You make a first pass, reflect, and then come back for more edits as many times is needed. My process was quite simple. 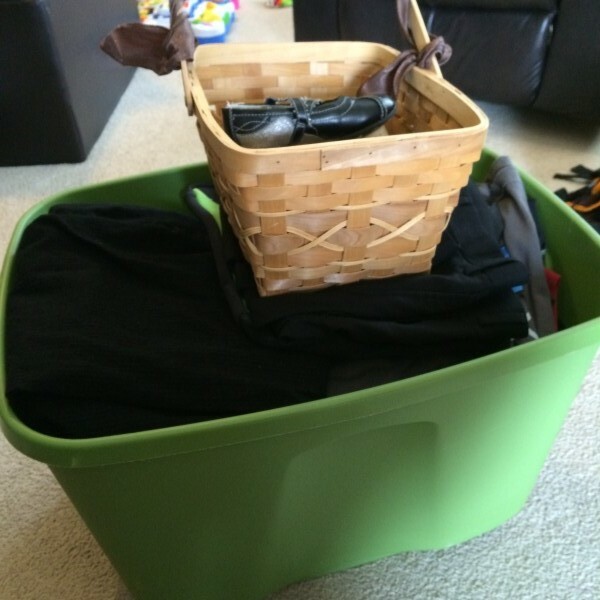 I had a big plastic bin to put clothes in, and I pulled out all my clothes from the closet and laid them on our bed. Then I went through and examined each article of clothing, asking myself “Do I love this?” If the answer was no, then in the bin it went. By the time I was finished, I filled the bin completely. This box of clothes got donated after spending the morning going through my closet. Lesson one: Re-evaluate your wardrobe at least four times per year. I recently changed jobs, and the dress code is much more relaxed. That’s great for me, but it means some of the clothes I had for my last job isn’t likely to be worn (particularly the logo’d polo shirts of my former employer). The new gig means I can wear t-shirts and even shorts if I wish (I know, right? ), so today was a great time to clean out some of those items. There are other reasons you might want to re-evaluate your wardrobe at least four times a year. Are things too big or too small because of, ahem, body changes? Got stains, rips, or items showing signs of wear? Do you really need that t-shirt from that concert you went to a decade ago that is all cracky and gross? Maybe it’s time to donate these items to someplace like Goodwill, turn them into shop rags, or just throw them away. I took my box of clothes to Goodwill. As an aside, I don’t donate clothes that I wouldn’t otherwise wear. If it has holes or are too worn, those go to the trash. In the end, I found out I had four black pinstripe pants that I hardly ever wear, so I donated two of them. There were some old shirts that I no longer love, so they got ousted. I found some belts and ties that I haven’t worn in ages. Best of all, I opened some space for some new t-shirts. I’m looking forward to doing some shopping for some fun clothes to wear to work and play. Lesson two: You can recycle metal hangers at your local dry cleaners. After I was done with my clothing purge, I had several hangers left over. As silly as it may be, I’m a little torn when it comes to hangers. I don’t care for metal hangers, because heavier items like jackets and jeans tend to wear them out much more quickly than plastic hangers. But the problem I have with plastic hangers is, they can’t be recycled. Most plastic hangers I’ve found can’t be thrown into my recycling bin when they break. I have been working on purchasing fewer items that can’t be recycled when I’m done using them, and plastic hangers clearly break that rule. But for now, they win over metal hangers in our household. Where I live, there are several Scotch Cleaners around town, and one just down the street from me. I called them up and found that they will take your metal hangers and recycle them. So on my way to Goodwill, I stopped in and dropped off the hangers in a special bin they had at the front of the store. Got extra hangers around the house? 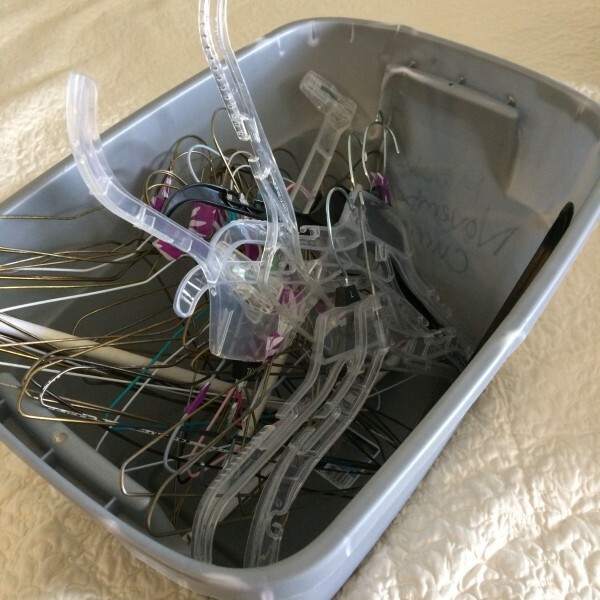 Many dry cleaners will recycle your old metal hangers. Sadly, I was still left with some plastic hangers (the ones you get from a store when you buy clothing) that neither Goodwill nor the dry cleaners would take. They can’t be recycled, so they came back home with me. From now on I’ll make a conscious effort to not let any of those hangers come home from the store. Finally, I thought I would mention Project 333. Started by Courtney Carver, Project 333 is a minimalist approach to fashion. I will admit I haven’t given it an honest try, but I have been thinking about it more lately and will likely give her plan a trial in the near future. Read the rules of Project 333 and decide for yourself; maybe it’s just the plan you need for a more simple relationship with your wardrobe. This entry was posted in Recycled, Reused, Tips on May 23, 2015 by ericjgruber.